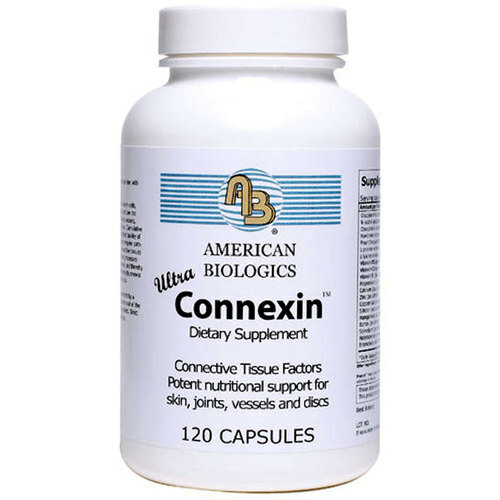 American Biologics Connexin combines together Vitamin C, Calcium, Zinc and more. 警告: Keep out of reach of children. Do not take more than recommended dosage. Pregnant or nursing mothers should consult a physician before using any dietary supplement. 注意事项: Gluten Free. Yeast Free. Wheat Free. Corn Free. Soy Free. Dairy Free. Sugar Free. Starch Free. Artificial Coloring Free. Artificial Flavoring Free. 推荐用法: As an adult dietary supplement, take 1-2 capsules 2 times per day with meals, or as directed by a healthcare practitioner.